The first Imperial Russian postal stamp was issued in 1857. The Postal Department’s circular says: “Starting from the 1st January of the next year 1858 usual private letters to all the places of the Empire, the Kingdom of Poland, the Grand Duchy of Finland brought to the post in usual envelopes or without envelope at all just with addresses written on the letter itself should be sent only with the stamp corresponding to the letter weight”. So, the first Russian 10 kopecks stamp went on sale December 10, 1857, but really started a circulation from January 1, 1858 ( and later, from March 1 – in the Caucasus, Transcaucasia, and Siberia area). Since this date all private internal letters have been sent only with postage stamps that were cancelled with pen cancellation by two crossed lines. A 5 kopecks (5 kop.) stamp for local postage was introduced in 1863, and next year a new common design, with the arms in an oval, was unveiled for 1 kop, 3 kop, and 5 kop values (international mail). After 1866 the stamps were printed on watermarked with a pattern of wavy horizontal or vertical lines. The coat of arms design was changed in 1875, and used for 2 kop and 8 kop values, and a 7 kop in 1879. The 7 kop was also printed on revenue stamp paper watermarked with a hexagon pattern; these are quite rare. A new issue of 1883 featured an updated design, lower values printed in a single color, and new high values – 14 kop, 35 kop, and 70 kop. In January 1884 were issued 3.50 rubles and 7 rubles stamps. 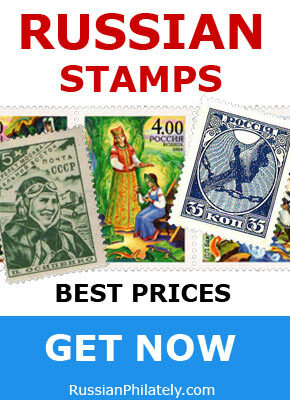 The first Russian semi-postal stamps were issued at the end of 1904. The four values were each sold at additional 3 kopecks over face value for the benefit of orphans of soldiers killed during the Russo-Japanese War. In 1909 were issued new Russian stamps with a mix of old and new designs, all printed on unwatermarked wove paper with lozenges on the face to discourage postage stamp reuse. Russia’s first commemorative issue was unveiled on January 2, 1913 to celebrate the 300th anniversary of the Romanov dynasty. The 17 stamps featured portraits of the various Tsars, as well as views of the Kremlin, Romanov Castle and Winter Palace.